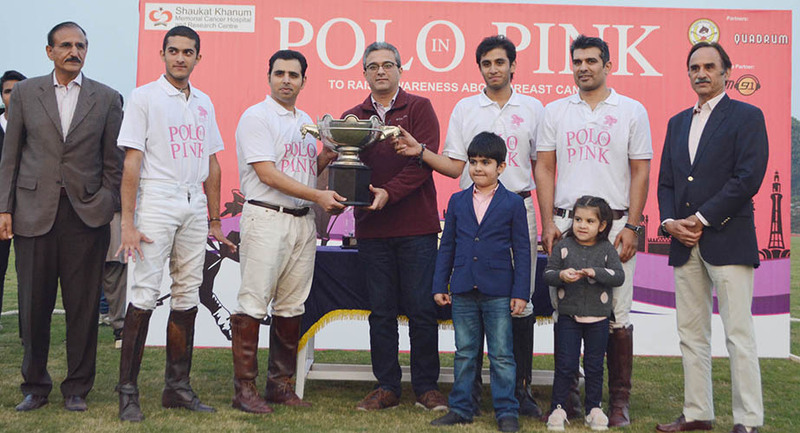 LPC LAHORE: Remington Pharma Polo emerged as ‘Polo in Pink 2017’ title winners after beating Newage by 9-8½ in the thrilling final played here at the Lahore Polo Club (LPC) ground on Sunday. Bilal Haye is in great form from the last three tournaments and this final too, he has stamped his authority and pumped in superb seven goals from the winning side while Bilal Hayat Noon struck the remaining two to complete the tally. From the losing side, which had half goal handicap advantage, Shah Shamyl Alam converted sterling six goals and Adnan Jalil Azam and Mir Huzaifa hit one goal apiece but their efforts couldn’t bear fruit as their team lost the final with just half goal margin. Remington Polo took 2-1 lead in the first chukker but Newage bounced back in style and succeeded in taking 4-3 lead in the second chukker. Remington Polo also fought back well and hammered a hat-trick to have 6-4 lead but Newage thwarted two tremendous goals to level the score at 6-6 just before the end of the third chukker. Both the teams played out their hearts in the fourth and decisive chukker, but Remington’s players extra efforts and hard work bore fruit for them and they managed to convert three goals while Newage could score two as the final score was 9-8 in favour of Remington Polo. Saqib Khan Khakwani and Raja Arslan Najeeb officiated the final as field umpires. Earlier in the subsidiary final, Guard Group defatted Rijas by 6-5. Taimur Mawaz Khan was the main scorer from the winning as he scored fantastic four goals while Taimur Ali Malik and Samir Malik contributed one goal apiece. From the losing side, Raja Arslan also played superb polo by pumping in four goals but his heroics couldn’t help his team score victory. Omar Asjad Malhi also hit one for Rijas.